Mention British farm animals to most people and they’ll conjure up an image of green fields trimmed with hedgerows, black and white cows grazing the grass and chewing the cud. Or maybe fluffy sheep cropping the sparse vegetation on a mountainside. At a push, perhaps some cheeky goats in their perennial eating-the-washing-line stance. What they probably won’t come up with is a herd of black water buffalo, great horns curling over their horizontal ears. But that’s exactly where this week’s cheese comes from. And the buffalo aren’t paddling in the floodplains of Pakistan or India; they’re grazing the pastures of Somerset. I was excited to get a Tweet from a fellow local cheese-fancier, telling me that the buffalo farm had come to town. Like some kind of crazy cheese-twitcher, I grabbed my bag and headed off for the bus-stop. Twenty minutes later and the lady at the farmer’s market was talking me through her buffalo cheeses. I think I must look like a bit of a cheese-wuss as mongers and market-folk always tend to point me towards their ricotta/mozzarella type wares when really I’m eyeing up the scary, hairy-looking cheeses in the corner. So as soon as she said, ‘This is our stronger cheese, Junas’, I had speared it with a cocktail stick as quick as you like. Junas is an unpasteurised, organic, semi-hard to hard buffalo milk cheese, made by Alham Wood Organics in Shepton Mallet. Frances Wood’s family have farmed locally for generations – her grandmother was a champion dairymaid and her great uncle renowned for his Cheddar – but it was only when Frances and her late husband Bert moved to Higher Alham Farm that the cheese-making genes kicked in. Like so many farmers of the period, the family were looking to diversify production in the face of milk quotas when Frances saw a feature about water buffalo on the television. In 1997 she set off on a scouting mission to northern Romania and was soon followed home by 25 cows and one bull (they obviously settled in to English life as there are now some 200 of the beasts roaming the pastures of the West Country). The Woods experimented with traditional cheese-making recipes on the kitchen table and Junas was one of the first cheeses to be produced. The cheese is named in honour of the matriarch of the herd, Juna, and her name itself is Romanian for head cow. 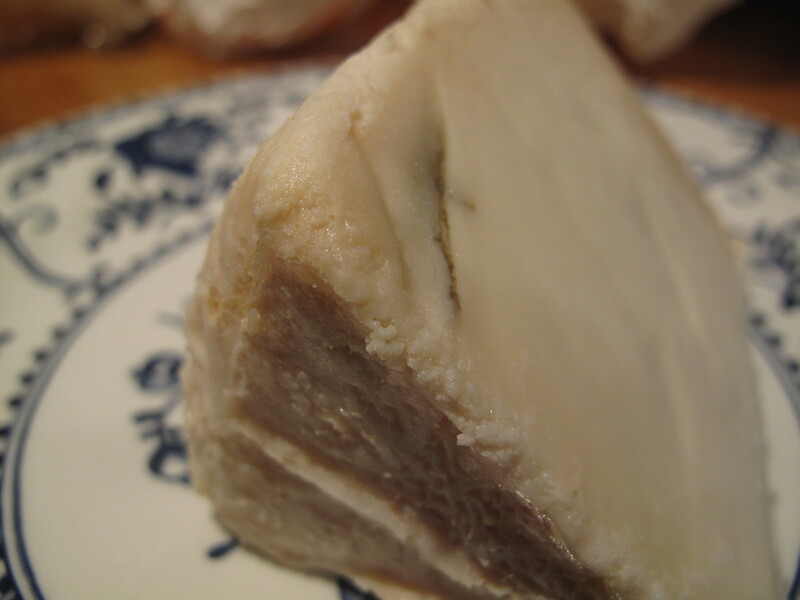 It’s a similar cheese to pecorino or manchego, aged to about six months, firm but very creamy and smooth. The buffalo milk does give it a unique taste though; my first reaction was ‘Oh wow, that’s excellent’ but it has a tang to it that the Other Half wasn’t so keen on. A former colleague of mine used to bring back buffalo fudge from her family farm in Pakistan and even then there was a sharpness that cut through the creamy milk and sugar. I like a tangy cheese though so this is a favourite. I may have mentioned before that I have a cow phobia (bovinophobia – see, it’s real, it has a name and everything). It’s as a result of being ganged up on by some cows on the farm I grew up on. Now I’m just thankful I didn’t grow up on a buffalo farm. Research from Somerset Life, the Telegraph and Alham Wood Organics. When I was living on the farm in Bolivia, our neighbours raised buffalo. Stubborn animal. The herd would take it into their collective heads and go walkabout. Barbed-wire fences didn’t worry them, they just went straight through and the farmer could awaken in the morning to find that his buffalo were 25kms away, with another farmer complaining of the damage to fences etc. Never tried the cheese though, but given the chance I would. Yes, I’ve heard they can be pretty tricksy and they’re so big you wouldn’t want to mess with them. The cheese-makers produce some feta and ricotta style cheeses too which I must try. I used to make ricotta from the whey after I had extracted the curds when I lived on the farm, but from cows’ milk. Sometimes I would make ricotta, but normally I chased the requeijão (cream cheese), I used to use that in place of butter. Really enjoying your posts, please keep ’em coming. I live on the Suffolk/Norfolk border and have been impressed since moving here from London how many really good local cheeses are made locally which never seem to make it to the Big Wen. You should come and visit! As long as there’s cheese to be eaten, I’ll keep going! 😉 East Anglia isn’t known for it’s cheeses, is it? I know there’s a lady in Suffolk (Sciapod Dairy) trying to recreate lost Suffolk cheeses and I’d love to visit her. I was also reading about Baron Bigod cheese from Suffolk recently, which I’d like to try – but you’re right, not sure it makes it to the Big Smoke. White Lady is delicious too and you should try Suffolk Gold, the latter made by a couple up the road from us who keep Jerseys (or Guernseys, can’t remember). Maybe I should send you a food parcel!